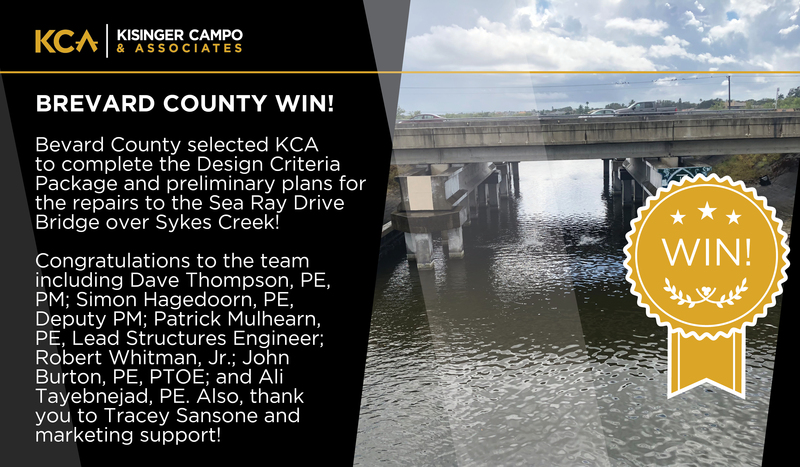 KCA received great news on January 17 when we were selected by Brevard County to complete the Design Criteria Package and preliminary plans for the new Sea Ray Drive Bridge over Sykes Creek Repair Design-Build (D/B) Project. The win signifies KCA’s first structural engineering design project for the County and adds yet another design project to KCA’s already impressive structural design project experience resume. The project consists of the development of the Design Criteria Package and preliminary design plans for permanent repairs to the Sea Ray Drive Bridge over Sykes Creek on Merritt Island in Brevard County. The County, in conjunction with FEMA and FDOT District Five, selected KCA to help identify bridge deficiencies caused by storm events and make the Sea Ray Drive Bridge fully functional. Congratulations to the pursuit team including Dave Thompson, PE, Project Manager (PM); Simon Hagedoorn, PE, Deputy PM; Patrick Mulhearn, PE, Lead Structures Engineer; Robert Whitman, Jr.; John Burton, PE, PTOE; and Ali Tayebnejad, PE. And thank you to Tracey Sansone and marketing support who helped with the preparation of the proposal and the marketing efforts that contributed to this win!